Summary of President Ronald Reagan for Kids: "The Gipper"
Summary: Ronald Reagan (1911-2004), nicknamed the "Gipper", was the 40th American President and served in office from 1981-1989. The Presidency of Ronald Reagan spanned the period in United States history that encompasses the events of the Cold War Era and the age of the Space Race and the Cold War Arms Race. President Ronald Reagan represented the Republican political party which influenced the domestic and foreign policies of his presidency that included Reaganomics, the economic policies introduced during the Reagan administration. The major accomplishments and the famous, main events that occurred during the time that Ronald Reagan was president included the assassination attempt on his life, perpetrated by John Hinckley Jr., the Iran-Contra Scandal aka Irangate and the establishment of the Strategic Defense Initiative (Star Wars). In events abroad the policy of Glasnost introduced by Mikhail Gorbachev brought reforms to the Soviet Union that would ultimatly lead to its collapse. Ronald Reagan died after suffering from Alzheimer's disease on June 5, 2004, aged 93. The next president was George H Bush. The summary and fact file of Ronald Reagan provides bitesize facts about his life. The nickname of President Ronald Reagan provides an insight into how the man was viewed by the American public during his presidency. The meaning of the nickname "Gipper" refers to a character called "George the Gipper" as a movie star starring in a movie called Knute Rockne, All American. The character traits of President Ronald Reagan can be described as outgoing, friendly, confident, charming, cheerful and superstitious. It has been speculated that the Myers-Briggs personality type for Ronald Reagan is an ESFP (Extraversion, Sensing, Thinking, Judgment) with the temperament of an idealist. An outgoing, fun, unconventional and attentive character who excels in interpersonal interactions. 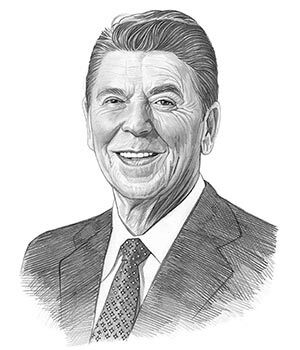 Ronald Reagan Personality type: Resourceful, enthusiastic, optimistic, gregarious and persuasive. Summary of the Cold War: The Cold War (1945 - 1991) was a 'war of words' involving the Cold War Space Race and the Cold War Arms Race involving the nuclear build-up between the USA and the West and the Communist countries dominated by the USSR and China in the East. Ronald Reagan was one of the nine US Presidents who were in office during the dangerous period in history known as the Cold War in which the US adopted the policy of Containment to restrict the spread of communism abroad. Summary of Stagflation: Stagflation was the term used to describe the state of the nation's economy during the 1970's. Stagflation was a combination of economic stagnation, rising prices and inflation. Presidents Richard Nixon, Gerald Ford and Jimmy Carter all failed to curb stagflation and President Reagan faced the worst recession since the Great Depression. The economic policies failed to work and stagflation continued into the presidency of Ronald Reagan when the economy finally began to recover due to his economic policy known as Reaganomics. Summary of the Reaganomics: Reaganomics was the name given to the economic policies introduced during the Reagan administration which ended the Stagflation recession. Reaganomics encompassed actions taken to decrease the growth in government spending, reduce taxes, ease economic regulation and promote unrestricted free-market activity. Summary of the Reagan Assassination Attempt: The Reagan Assassination Attempt on March 30, 1981 was perpetrated by John Hinckley Jr. as President Ronald Reagan was leaving the Hilton hotel in Washington D.C. John Hinckley, Jr. shot President Reagan in a misguided attempt to impress Hollywood movie actress Jodie Foster. The Reagan assassination attempt was played down by the president remarked to his wife Nancy "Honey I forgot to Duck". Summary of the Iran-Contra Scandal: The foreign policies of President Ronald Reagan led to the scandal known as Irangate or the Iran-Contra Scandal. The scandal arose due to a secret arrangement to provide financial aid to the Nicaraguan contra rebels from profits gained by selling arms to Iran. President Ronald Reagan had approved the sale of arms to Iran but had not been informed about the diversion of the money to the Contra rebel groups in Nicaragua. President Reagan insisted he had done nothing wrong, but the Iran Contra scandal seriously tainted his second term in office. Summary of the Strategic Defense Initiative (Star Wars): The Strategic Defense Initiative (Star Wars) was introduced on March 23, 1983 as the US response to possible nuclear attacks. The goal of Star Wars was to set up a large number of space satellites that would detect the launch, and then shoot down, any enemy missiles. The article on the accomplishments of Ronald Reagan provides an overview and summary of some of the most important events during his presidency. The following Ronald Reagan video will give you additional important history, facts and dates about the foreign and domestic political events of his administration.